Denk Strategic Wealth Partners – Commentary eLetter 7/27/2018 — Facebomb! Commentary eLetter 7/27/2018 — Facebomb! Long range forecasts and immediate-term forecasts are similar in one important way; both are much more likely to be accurate than are medium-term forecasts. For instance, take weather: Almost anyone can make a good prognostication that over a year’s time, say beginning in March, we will have a warming trend with frequent periods of rain. The warming trend will top out around the middle of August and by late September we will observe a cooling trend which will persist until at least January. Pretty easy, yes? On the other hand (have you noticed that many of our newsletters have two hands?) if I see a falling barometer, rising wind speeds and clouds darkening, I take that as a sign that I should consider rescheduling the company picnic because I know my immediate-term forecast is likely to be very accurate. It is the intermediate-term, say 3 to 6 months out that can be hardest to predict. Even though everybody involved in the trading world is fully aware of — and agrees with — one of Yogi Berra’s most famous observations, (“It’s tough to make predictions, especially about the future.”), the entire justification for stock markets is that it is a good idea to buy something today if that thing is going to be worth more in the future. But, how can one know? While there is always risk when dealing with the unknown, with enough data and sufficient skill, we can successfully move our enterprise away from simple gambling and into the much more attractive world of capital formation. The finance world is full of very smart people and smart people appreciate a good challenge. The problem is that it’s very, very hard to be really, really smart all the time. Occasionally, things don’t turn out as anticipated, or even within a range of differing anticipations. Exhibit ‘A’ is Facebook dropping 20% of its share value in one trading day, as it did this week. To put that in countable numbers, they took a 100 Billion Dollar loss in market capitalization. Trust me when I say THAT was in nobody’s forecast. And, this precipitous fall at Facebook had a substantial influence on the NASDAQ. On a day that saw the Dow close at a 5-month high, the tech-heavy NASDAQ closed down about 1%. As you may know, that index is weighted by market cap size. So, the companies with the biggest market cap tend to push their weight around and can have an outsize influence on the performance of the index. We are in the Summer ‘earnings season’ so a lot of companies are reporting to shareholders (and the general public) how well / poorly they are doing and what they see as prospects for the future, near-term, intermediate-term and long-term. Analysts at various institutions have already made estimates on what many company’s earnings reports will say. And accordingly, investors are prepared to adjust their estimates of valuations based largely on if a company’s performance is meeting or beating or failing to meet expectations. What hit the Facebook shares so hard was not that they came in below expectations. After all, the miss was not huge. What was fully not seen by the forecasters was Facebook’s intermediate term guidance that they had internal structural issues that would be driving costs higher and revenues lower and that situation may well last through 2019. This morning Twitter — which operates in a similar space to Facebook — is also taking a big hit. as I write this newsletter, it too is off about 20%. Contrary to the problems at Facebook, Twitter’s case is intentionally self-inflicted. When they discovered that there were a substantial number of fake Twitter accounts they made the decision to remove them, even knowing their advertising clients would be unhappy at the reduced user base numbers. They saw a problem and they’re fixing it. That earns a hat-tip from us. Asking big companies to be smart all the time is not a reasonable expectation. What is reasonable is to expect timely and efficient corrective action when the un-forecasted event shows up. Market Minute July 27, 2018 — Worth Watching? Here are a couple of charts for your consideration today. Note in chart one, we are comparing the year-to-date returns of the small-caps (red line) with emerging markets (green line). 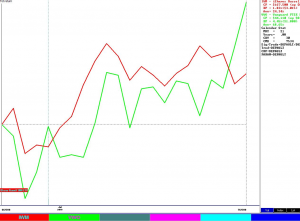 In the time period up to July 25th as shown on this graph, we have been happy to have emphasized small-caps in our client portfolios (small-caps up 9%, emerging markets down – 2%). However, as we often comment, markets tend to be cyclical. Just as the berries at the grocery store are better in the summer than in the winter, small-caps and emerging markets also have a ‘season’, although the seasons of the stock holdings are not nearly as clearly defined as the seasons of the fruits. But now, it’s possible that things may be changing. Let’s look at only the past month of returns – same holdings, same colors. 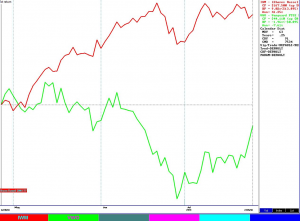 As chart 2 shows, the small-caps are up 1.8% but the emerging markets are up 4.45%. That’s quite a difference! This doesn’t tell us WHY there’s a difference, or what the future may bring, but it does suggest that (to quote Bob Dylan) ‘The times, they are (or might be) a changin’’. This could be just a temporary blip, or perhaps it indicates that it’s time for those emerging markets to play catch-up while the smaller stocks take a midsummer snooze.